LICKS Joint + Heart enhances joint health with high doses of joint lubricants. 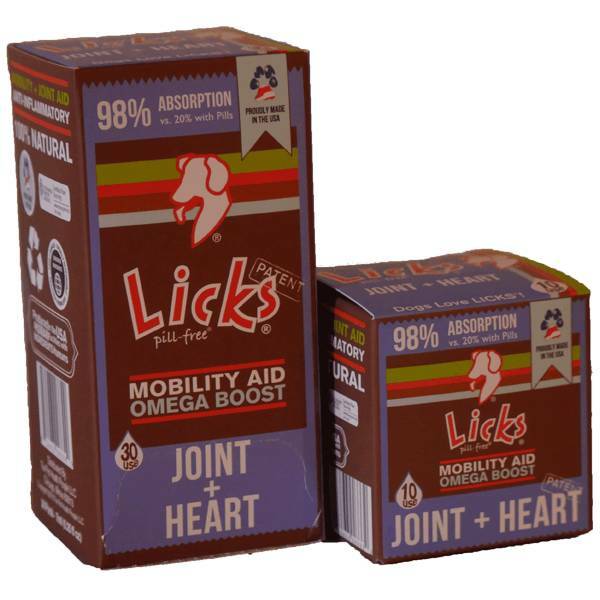 Eases discomfort and joint stiffness due to normal daily exercise and activity. Cautions: Safe use in pregnant animals or animals intended for breeding has not been proven. If lameness worsens, discontinue use and contact your veterinarian. Administer during or after the animal has eaten to reduce incidence of gastrointestinal upset. Directions for Use: Administer direct to mouth or in a separate bowl. Use consistently to see desired results. Refrigerate to thicken gel.